Juniors 15-18: The field of 13 broke up early with the main group fending off several attacks. 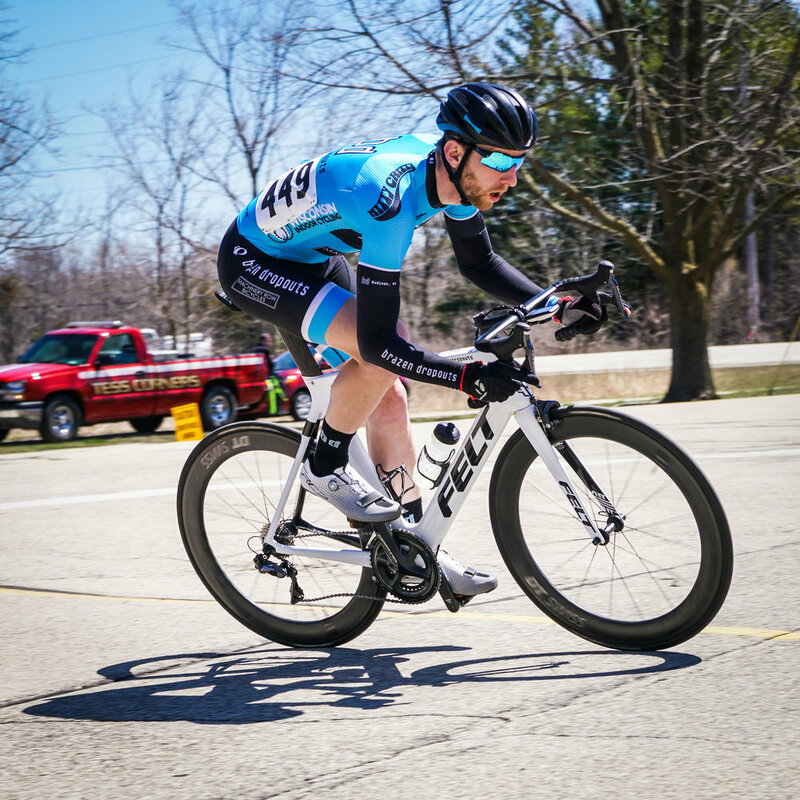 A late solo breakaway in the 25 minute race appeared to be holding until BD Jamani Bergh single-handedly chased it down on the last lap, with a final attack on the finish hill to open up a sizable gap to take the win! Jamani is in his second year with the Junior Dropouts program, and his serious off-season training is paying off early in the season. Look for him to be a podium contender in every Juniors race this season. Jamani Bergh patiently waiting to make his move in the Juniors 15-18 race (Photo: Rachel Bergh). Kaitlyn Agnew soloing to 1st in the Women's 4/5 race (Photo: Ethan Cayko). Cat 3/4: Several teams had strong contingents in this race so team tactics were sure to play a role. Around the 15 minute mark, Derek Landwehr and a Team WI/MOSH rider held a strong effort up and over the hill. The two worked well together, continuing to push the pace with hard pulls, and with the help of teammates in the pack, the gap grew from seconds to minutes. Any attacks from non-break teams or unattached riders were kept at bay thanks to BD's Lee Prouty, Kevin Sparks, Craig Billings, and other Team WI/MOSH riders. Thirty minutes later, with just one lap to go, the two-man breakaway caught the field, with Derek taking 2nd place in the end. Women Cat 4/5: After last week's 2nd place by only inches, first-year BD Kaitlyn Agnew was aggressive to make sure it didn't happen again. With six racers, there wasn't much space to hide from the wind, so what better way to shake things up? Her solo break held and she rolled to her first win! Masters 35+ 4/5: Matt Bruss hitched a ride with two very strong riders from Belgianwerkx and Diablo Cycling, creating a three-man break mid-way through the race. While Matt couldn't keep pace with the break, he held on for a very respectable third in the strung-out 28 rider field. Newer PostWCA Standings - BD's are looking good! Older PostFirst race, first podiums!